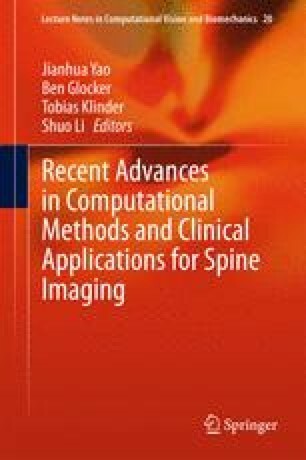 A framework for 3D segmentation of healthy and herniated intervertebral discs from T2-weighted MRI was developed that exploits weak shape priors encoded in simplex mesh active surface models. An ellipsoidal simplex template mesh was initialized within the disc image boundary through affine landmark-based registration, and was allowed to deform according to image gradient forces. Coarse-to-fine multi-resolution approach was adopted in conjunction with decreasing shape memory forces to accurately capture the disc boundary. User intervention is allowed to turn off the shape feature and guide model deformation when internal shape memory influence hinders detection of pathology. For testing, 16 healthy discs were automatically segmented, and 5 pathological discs were segmented with minimal supervision. A resulting surface mesh was utilized for disc compression simulation under gravitational and weight loads and Meshless-Mechanics (MM)-based cutting using Simulation Open Framework Architecture (SOFA). The surface-mesh based segmentation method is part of a processing pipeline for anatomical modeling to support interactive surgery simulation. Segmentation results were validated against expert guided segmentation and demonstrate mean absolute shape distance error of less than 1 mm.